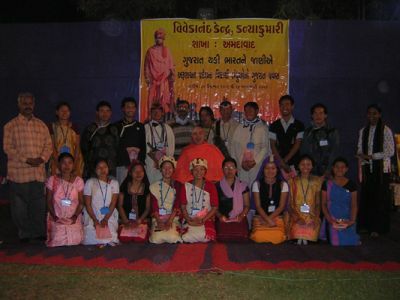 684th Yoga Camp (Jan 1, 2007 – Jan 10, 2007): New Year 2007 began with Meditation in the hours of dawn and Yogasana camp by H. H. Swami Adhyatmanandaji Maharaj, which concluded on Jan 10, 2007. Also, three week long 12th International Yoga Teachers Training Course (Dec21, 2006 – Jan10, 2007) was concluded on the same day. At the concluding ceremony, a guest of honor Vice Chancellor of Gujarat Vidyapeeth, Mr. Sudarshan Iyengar awarded diploma to the students who successfully completed the course. Shri Pratik Desai showed outstanding talent in the field of yoga among the yoga students participated in YTTC. 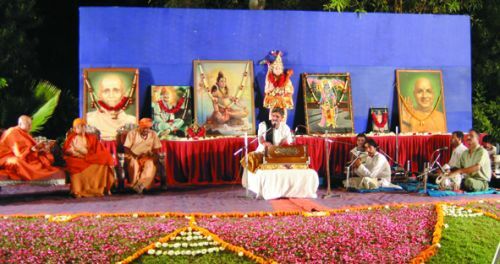 Welcoming New Year 2007: In the evening of Jan 1 2007, a special gathering was held at the Ashram. Sumptuous dinner was served and devotional music by Mayurika Oza enchanted every one. People cherished the sweet memories of late Dr. Shree J.N. Moudgill, who passed away a month ago. It was his 95th Birth anniversary. Shree Moudgill Saheb was the resident of the ashram for last few years of his life. He earned the respect and regards of all by his gentle, kind and loving nature. On Jan 1, 2007 after the morning Yogasana Class, Rev. 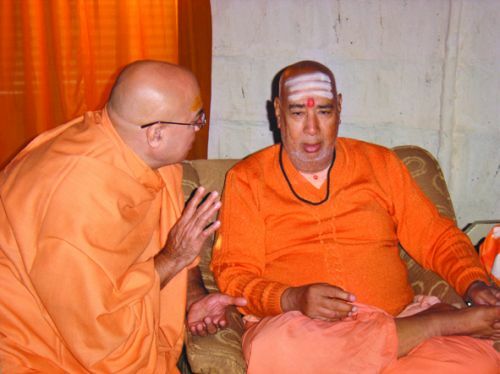 Sri Swami Adhyatmanandaji Maharaj had three hours drive to holy ashram of Brahamleen Sri Sri Sri Rang Avdhut Maharaj at Nareshavar. 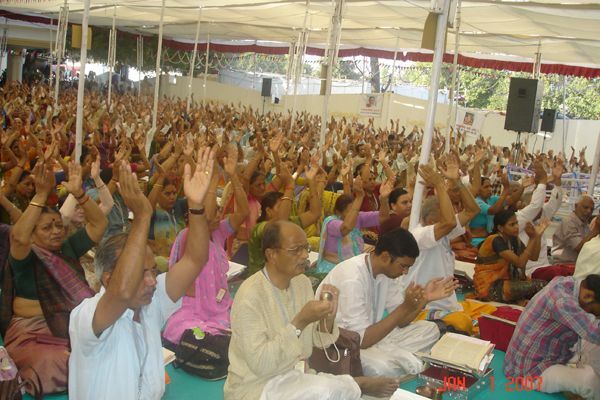 A grand congregation of 1008 devotees was gathered at the ashram for a week of "Guru Lilamrut Parayana". 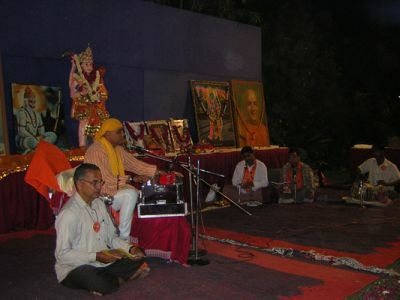 "Guru Lilamrut" is a Granth written by Sri Rang Avadhutji Maharaj. It contains 148 chapter and 19005 verses describing Lila of Lord Sri Dattatreya (incarnation of Vishnu). It is full of wisdom teaching, a perfect blend of Karma, Bhakti & Jnana. Pujya Sri led a soul stirring kirtan and blessed the devotees with his inspiring words of wisdom. This entire holy event was organized by Revered Dr. Indubhai Dave. In the evening Pujya Sri drove back to the ashram and joined the evening gathering. Visit to Gopari: Rev. 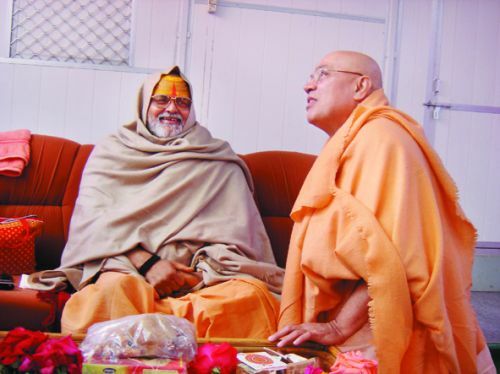 Sri Swami Adhyatmanandaji and Rev. Sri Swami Raghawanandaji (from Gangotri) visited branch of the Divine Life Society – Gopari (60 Kames from Vadodara). 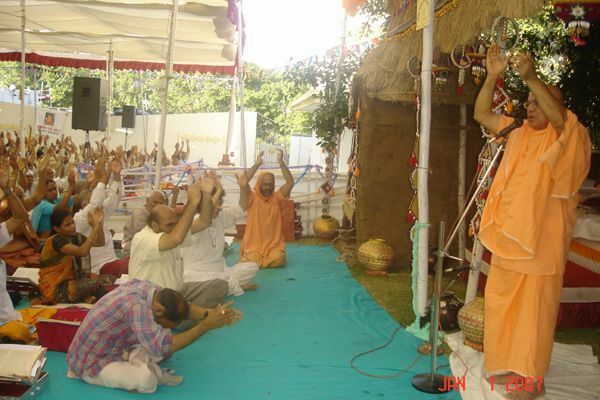 Devotees were overjoyed in holy presence of both Swamijis. They carried a procession with colorful band and traditional orchestra (dhol-nobat, etc) singing and dancing "Harinama Sankirtan" on the street, honoring Pujya Swamiji to seat on horse ride. Rev. Swamiji's inspiring words helped collecting Rs.1, 20,000 needed for completion of Shiva Temple of the village. Vivekananda Jayanti (Jan 12, 2007): Swami Vivekananadaji's Jayanti was celebrated on Jan 12, 2007 at the ashram. Twenty eighty students from Assam, Arunachal Pradesh visited Sivananda Ashram. They staged a traditional dance and drama of Arunachal and Assam tribe. It was organized by Vivekananda Kendra, Ahmedabad for this special occasion. Visit to Himatnagar, Ambaji, Rojanta & Ramnagar(Jan 13, & Jan 14, 2007) : Sri Swami Adhyatmanandaji's annual tour to North Gujarat was organized as usual on Jan 13th & Jan 14th. Satsangs were arranged at Himmat Nagar, Ambaji, Khedbrahma, Rojanta and Ramnagar Cumpa. All the satsangs were attended by large number of devotees and each major Satsang were concluded with grand community feast. Management of Sivananda Ashram is thankful to Sri Dilipbhai Gandhi (Himmat Nagar), devotees of Sri Gurudev at Ramnagar Cumpa and Sri Swami Guru Kripanandaji Maharaj for their hard work in organizing the programs. 685th Yoga Camp at Valsad (Jan 15, 2007- Jan 24, 2007): From Jan 15, 2007- Jan 24, 2007 Swamiji conducted Yoga, Meditation and Pranayam camp organized by Divine Life Society – Valsad branch. The evening discourses were on the subject of 'The Mind- its Secret and Solution'. During his stay, Pujya Sri was invited by number of education institutes of Valsad and vicinity towns. 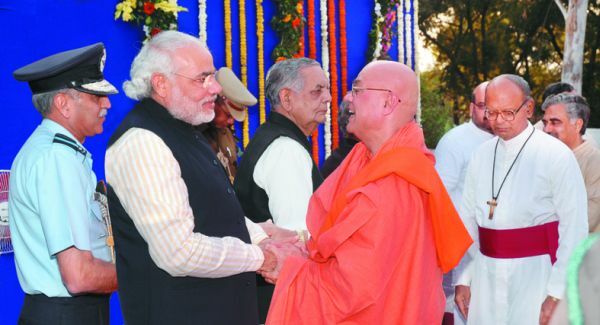 As always, many devotees invited him for Bhiksha and satsang in their homes. Laksha Chandi Koti Mahayajna: Honoring an invitation of the most worshipful Rev. Sri Swami Vidyanandaji Maharaj, Rev. 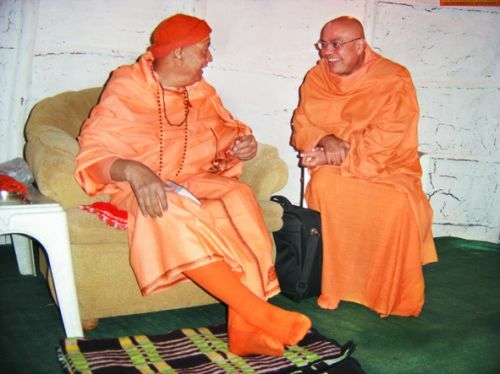 Sri Swami Adhyatmanandaji Maharaj visited Om Kutch (Nana Ponda) tribal area of Gujarat – Maharashtra. It was to attend a special event, a grand "Laksha Chandi Koti Mahayajna - one lakh times recitation of holy Sri Durga Saptasati (from Markandaya Purana) with Yajna and service to thousands of tribal folks and local natives. H. E. Governor of Gujarat Pandit Sri Nawal Kishore Sharmaji and H. E. Chief Minister Mr. Narendra Modi attended this grand event also. Yoga at " Darpan" Institute (Jan 8, 2007- Jan 20, 2007): From Jan 8, 2007- Jan 20, 2007, Ms. Sangeeta Thawani, a leading yoga teacher of Sivananda ashram conducted Yoga teaching program organized by "Darpan" institute for their students. It is a school of Indian Classical Dance and Drama founded by Smt. Mrinalani Sarabhai. About twenty-eight yoga enthusiasts participated in yoga activities. Patotsav of Sri Ram Mandir (Jan 26, 2007)On Jan 26, 2007 is anniversary of Sri Ram, Hanuman, Dattatreya and Lord Jagannath Temple of Ashram. 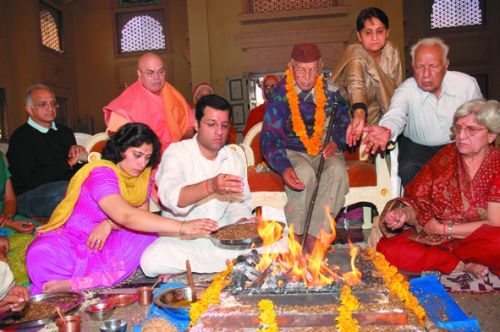 On this occasion, Sri Maruti Yagna was performed. Sri Ajay Yajnikji (Delhi) was invited and "Sri Sunderkand Parayana" was done. His wonderful discourse on Sri Ramcharitmanas continued for full five hours from 4.30 pm to 9.30 pm. About more than eight hundred devotees participated in this holy event and Mahaprsad was served to all. 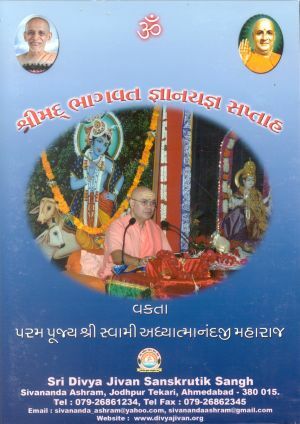 On Jan 2, 2007 All India Radio, Ahmedabad recorded Sri Swamiji's talks in four sessions, which were broadcasted during the month of Jan 2007 for the benefits of people. A special guest, Prof. P. B. Sharma, Vice Chancellor of Sri Rajiv Gandhi University of Science and Technology visited ashram on Jan 2, 2007. 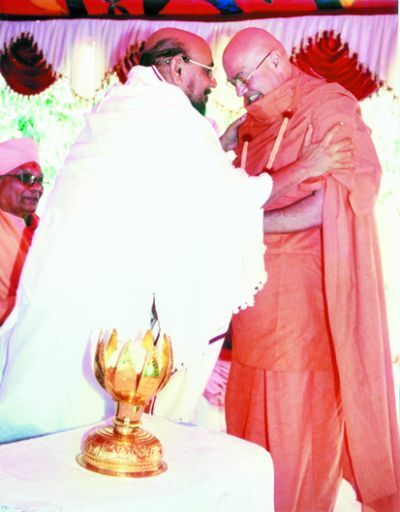 He praised Swamiji and the Ashram administration for the loving and tender care Prof. Dr. J. N. Moudgill received during last few years of his sojourn on this planet Earth. Professior Sharmaji conducted symposium for YTTC Students. On Jan 7, 2007 Thawani family organized Centenary Celebration of their "Beloved Bhau ", Rev. Sri Ramchandra D. Thawani at the Ashram. He is an ardent devotee of the Ashram. In the forenoon, Aayushya Homam was performed and in the evening get- together function was held in his honor. Bhau's kith and kin, grand children and great grand children all came from far and wide to celebrate this joyous occasion. They all had gala time playing Dandia- ras and enjoyed a grand dinner. Every one felt inner joy and satisfaction for celebrating his birthday in a spiritual way at Holy Sivananda Ashram. Sri Swami Adhyatmanandaji was invited to preside over 11th Tirthatan program of Sri Narayan Cultural Mission (A'bad). On Jan 8, 2007.Pujya Swamiji inaugurated a Home of Orphanage for blind, handicaps, deaf and dumb at Uvarsad (Gandhinagar), project undertaken by Sri Sadvichar Parivar. Donation of Rupees ninety six lakhs were gathered with collective efforts of all including Pujya Swamiji for this project. 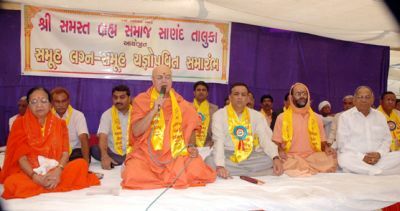 On Jan 29, 2007 Sri Swamiji was invited to inaugurate a week long Stress Management Program organized by Indian Army 11th Division of E. M. E. Group of Ahmedabad. Deputy General Officer, Brigadier S. G. Jagdev welcomed and thanked Pujya Sri for his selfless services to the Indian Army. 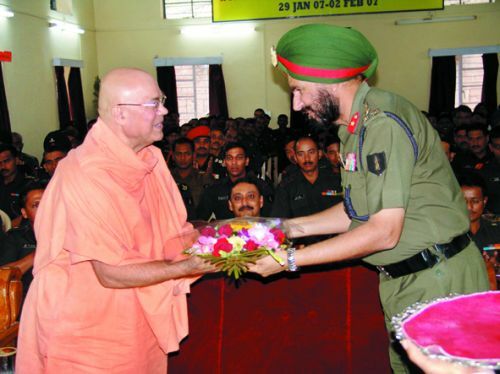 Swamiji has been teaching army troupes, a Yoga way of life for last thirty years through his Yoga camps. On Jan 30, 2007 on Pujya Bapuji Mahatma Gandhi Nirvan day, Sri Swamiji Maharaj attended all religion prayer at Sri Sabarmati Ashram of Revered Bapuji. In the afternoon, Sri Swamiji graced Silver jubilee function of Swavlamban Institute and annual function of Gayatri Institute of Technology and Science. On Jan 31, 2007 was concluded with unforgettable evening of Sri Sri Sri Sunderkand Parayan by Sri Ashwin Pathakji at the Ashram. 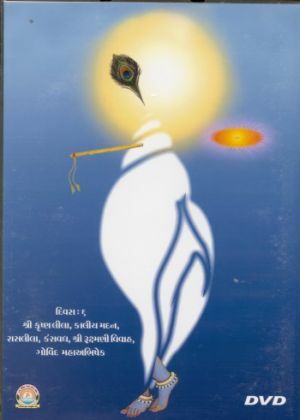 Gujarat Divya Jivan Sangh announces " Mauna (Silence), Dhyana (Meditation) & Japa (Repetition of Lord’s name) Shibir''. Come out from your busy life and enjoy being in Silence to reflect and recharge, to find inner peace and beauty of the Soul. Allow cleansing power of nature to awaken your inner SELF! During your stay with us satvic salt less food, comfortable accommodation will be provided.There will not be any discourses or talk. You will be in holy presence of H. H . Sri Swami Adhyatmanandaji Maharaj. "Srimad Bhagavata- a Treasure House of Divine Knowledge. You should conduct Bhagvata Saptaha in your house once every year. This will contribute to your happiness and prosperity. Every one of you should have a copy of the Bhagavata in your house"- Swami Sivananda. To listen to Srimad Bhagvata Katha itself is a great fortune and that too, from the lips of H. H. Sri Swami Adhyatmanandaji Maharaj. It is indeed spiritual feast for a blessed soul. Now, available on DVD's for the busy and working people who could not attend the live Katha.